A fluid driven electricity generator comprises a magnetic stator 18 and a rotor assembly, the rotor assembly comprising a rotor cylinder 19 attached around a vertical rotor shaft 10 and which is arranged to rotate within the magnetic stator 18, the generator also comprising rotor blades 24 which act to drive the generator when impacted upon by the fluid in any direction. The generator also comprises cooling means to prevent it from overheating. The rotor cylinder 19 may also be magnetic and may comprise windings and laminated iron plates. Preferably the generator is air (wind) driven. Also disclosed is a vehicle comprising the disclosed electricity generator, the generator being arranged to supply electricity to the vehicle (figures 11 and 12). I am looking for either an outright sale, a license with royalties or any other form of partnership. 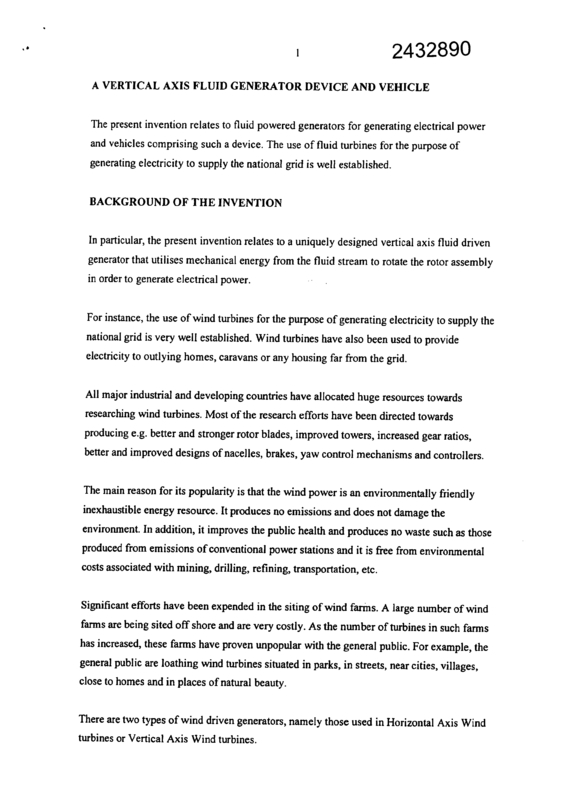 of the invention can be deployed throughout the world, particularly, the developing countries and regions that are not linked to the national grid. The generator can be produced from utilizing re-cicyable materials found in rejected vehicle generators. I do have a Trademark linked to this invention. The prototype of this invention has been developed and, the generator, has ungone successful substative independant tests using wind-tunnel. Page created at 2019-04-22 14:37:15, Patent Auction Time.